I haven’t done any kind of comprehensive review of vegetable gardening books, but I read a lot and I love books on cooking and gardening the most. While there is a lot of gardening information on the internet, not all of it is trustworthy, besides sometimes a book just feels right in your hands. If I were just starting a vegetable garden, there are two types of books I’d want. 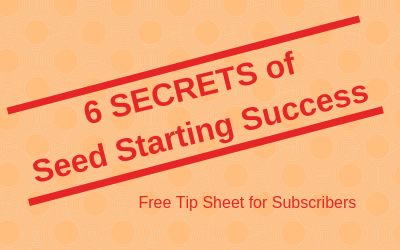 Beginners have basic questions and need a guide book that is like a friendly, knowledgeable neighbor. 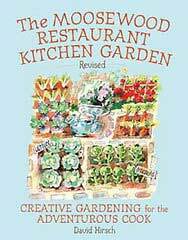 A few months ago, I came across the Moosewood Restaurant Kitchen Garden, revised edition (10 Speed Press, 2005, $19.95) and have been really impressed by it. In addition to listing the vegetables you might want to grow, when to start them, how to maintain them, and how and when to harvest them, author David Hirsch offers recipes and a dandy 30-page section in the back with basic information on placing your garden, soil, compost, mulching, and other techniques gardeners need. The book has enough information about everything but not so much you are overwhelmed. 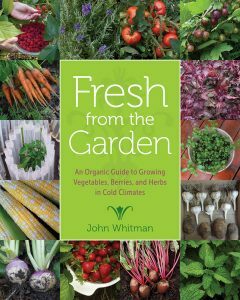 Update from 2018: If you live in the North, check out John Whitman’s new vegetable book, Fresh from the Garden: An Organic Guide to Growing Vegetables, Herbs and Berries in Cold Climates (University of Minnesota Press, 2017). This is a comprehensive guide to growing food in cold climates and would provide all the information a beginning gardener needs. The book won a Gold Medal in the 2017 GWA: Association for Garden Communicators awards. The truth is, my book (The Northern Gardener, from Apples to Zinnias) was nominated in the same category. I did not mind losing to John’s great achievement. When should you plant tomatoes in Minnesota? (Later than you think!) When should cover your crops in the fall and how do you “put the garden to bed?” A book that tells you when to do what is useful, especially for new gardeners. Melinda Myers, Wisconsin’s gardening guru, has a great book for this called Month-by-Month Gardening in Minnesota. It’s divided by months, of course, but also by what kind of gardening you’re doing. So, you can check in March and find out that now is a good time to start seeds. She also tells you how. Another calendar book I like is The Time-Saving Gardener, by Carolyn Hutchinson. It not only tells you when to do things, but Hutchinson has lots of step-by-step diagrams to follow. She also divides tasks by season rather than month, which makes the book more applicable in northern climates. In addition to a couple of books, I’d check out magazines — ahem, Northern Gardener — and the web for information. Experienced gardeners, help me out. What books would you recommend to a new vegetable gardener? You’ve mentioned several of my favorites (and I have previously lent a beginning gardener Barbara Damrosch’s The Garden Primer for its good discussion of garden tools). I am also very fond of Jerry Minnich’s The Wisconsin Garden Guide, which is regionally appropriate, takes an organic, soil-building approach to all types of gardening, and includes a good care guide for the common vegetable groups. It was once described in Organic Gardening magazine as the best regional gardening book in America. I’m digging the Guide to Minnesota Vegetable Gardening (which also includes herbs and some fruits) by James A. Fizzell. It doesn’t have a lot of pretty pictures, but it has LOTS of information that is perfect for beginners. It describes when, where, and how to plant each vegetable or fruit, gives you care and maintenance advice, and includes helpful tables on different varieties, the number of days it takes for each to mature, and specialized comments about each variety (such as which are good for pots, color, taste, shape, etc.). I’m a new MN vegetable gardener, and these suggestions are most helpful. Thanks very much! (I’m preparing my soil for next year’s planting, as I recently purchased a home, and completely missed my chance to plant anything this year). I’ll be back for more great tips.